What investment strategy would have given you the highest returns in Europe over the 13 year period from July 2000 to July 2014? In this article I summarised the master’s thesis of Andreas Hennes (completed at Goethe University Frankfurt am Main on 14 September 2015) where he set out to test exactly that. Reducing portfolio diversification to 25 companies can increase your returns. Multi-Factor Strategy 1 (MFS1) is similar to James O’Shaughnessy’s Value Composite Two which ranks all companies based on Book / Price, Earnings / Price, Sales / Price, EBITDA / EV, Operating Cash Flow / Price and Shareholder Yield. 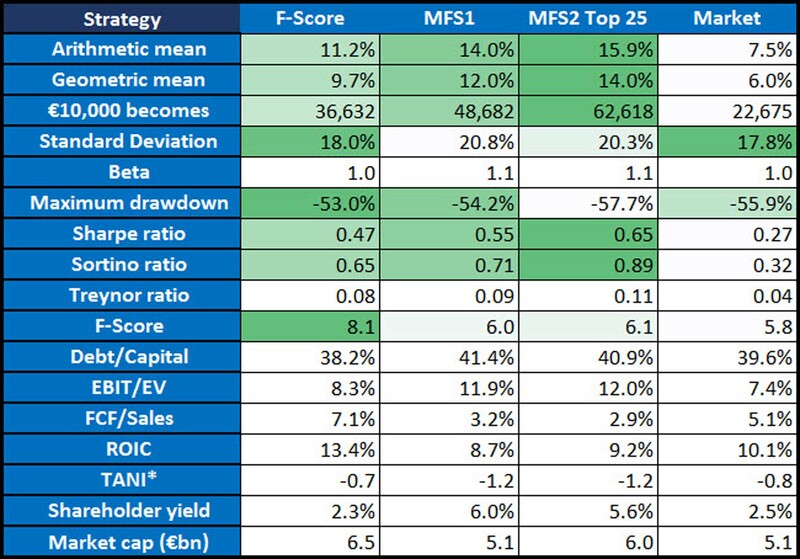 Multi-Factor Strategy 2 Top 25 (MFST2 Top 25) = Selected the 25 highest-scoring stocks per decile from the Multi-Factor Strategy 1 strategy but it also included 6-Month Momentum. It is thus a more concentrated strategy (only 25 positions) than the Multi-Factor Strategy 1 and it includes 6-Month momentum. First a reminder, the Multi-Factor Strategy 2 Top 25 (MFST2 Top 25) selected the 25 highest-scoring stocks per decile using the following ratios: Book / Price, Earnings / Price, Sales / Price, Div/P, Operating Cash Flow / Price and Shareholder Yield and 6-Month Momentum. Remember the Multi-Factor Strategy 1 (MFS1) is similar to James O’Shaughnessy’s Value Composite Two which ranks all companies based on Book / Price, Earnings / Price, Sales / Price, EBITDA / EV, Operating Cash Flow / Price and Shareholder Yield. The difference between James O’Shaughnessy’s Value Composite Two and the MFS1 investment strategy is instead of EBITDA / EV he used Div/P. It is a pity that this strategy was not also tested with momentum as I liked to see if Andres also found that momentum can add a lot to the returns as we found in our research study (also tested in Europe from June 1999 to June 2011). To help you make sense of all the results (single and multiple ratio strategies) I put them all together (only results of Quintile 1) in one table and added colour to the chart. There was no link between ROIC and the strategies that performed best. This is something we also found in a lot of other research – quality as measured by ROIC does not help your returns. To help you make use of the results of this research here is how you can easily find investment ideas using the best strategy from the paper. As I mentioned the Multi-Factor Strategy 2 consists of combining The Value Composite Two investment strategy with 6-months momentum. You can either buy a few companies each month or as in the study buy 25 companies and re-balance your portfolio after a year. As you can see it is very easy to select the ratios and indicators you need which will give you a list of companies that look like this. Your list will of course look different because the ranking of the companies change all the time. You can save the screen – and open it with a few mouse clicks – making it easy for you to get the latest companies selected by the screen. 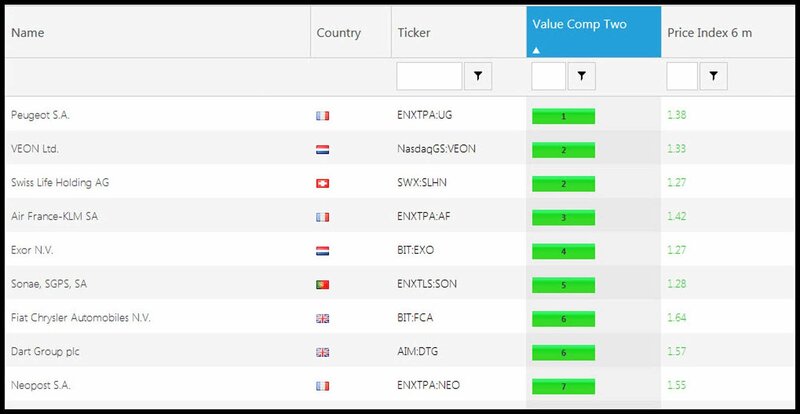 You can also export the companies selected by the screener to Excel to analyse the results further. Some time ago we tested the Piotroski F-Score with 13 other investment strategies to see if it could increase the returns. What we found was remarkable. Combining the F-Score with another investment strategy can give you a lot higher returns – on average 210% over 13 years. Here you can get all the information on how well the F-Score worked: Can the Piotroski F-Score also improve your investment strategy? Even though we did not test the Value Composite Two with the F-Score, I am sure you will agree if it increased the return of 13 other investment strategies it is very likely to also increase the returns of the Value Composite Two investment strategy. Don’t hesitate, you really have nothing to lose – if you are not 100% satisfied with the screener you get all your money back – guaranteed! PS Why not sign up now, while this is fresh in your mind?